When our children are upset, freaking out, throwing a fit, having a tantrum, we often start feeling really freaking out, tantrumy ourselves. And one of the reasons for this is there’s something called mirror neurons. These are basically cells in our brain that allow us to experience a little bit of the people’s experiences around us. It allows us to kind of read other people and experience joy and sadness with others. So they are a good thing. But in these types of moments, we actually – our internal state and our emotions ¬– mirror to some degree what our child is experiencing. So when our child is feeling out of control and full of rage, we start feeling that as well, because our nervous systems are captive and connected to one another. So one of the ways that we can actually use this to our benefit is to… if they’re up here in terms of anger, we can sort of come right here. If we’re just still totally peaceful and calm way down here, it’s not going to work – it’s going to be a mismatch. But if we come right below them and say, “Oh, you’re so mad I’m feeling kind of frustrated too,” but a little bit lower than they, they can start coming down and we can start working together to calm down. And of course don’t forget the importance of taking big, deep breaths. 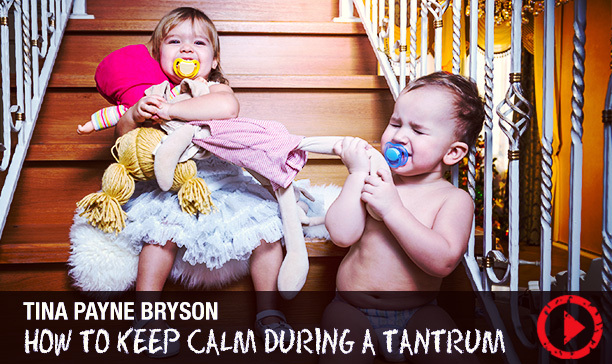 That helps us calm down so we can get our child calmer as well.